Make your backyard a summer haven for wild birds! Not only are you supporting our wild birds, you're getting a front row seat to see birds at their best! And it's easy! For more info on how to make your backyard a summer haven for wild birds, see our resource page: Wild Birds, Summer and Water. See Mosquitoes, Bird Baths and Your Backyard to find out more. 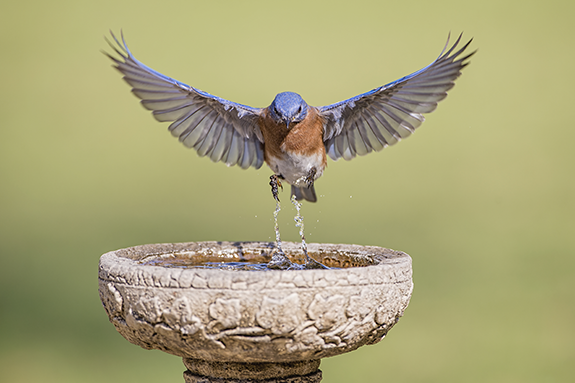 Worried about mosquitoes in your bird bath? Don't! Birds eat mosquito larvae! No self respecting bird will leave this tasty treat behind. Mosquito larvae takes minimum 7-10 days to hatch. As a conscientious host, during that time you will have freshened the water several times. Mosquito larvae tubers will drown due to the frenzied, bathing activity of your guests and the timely refilling and freshening you do..
Clean out your bird houses/nest boxes after each brood and they will nest again!! Cavity nesting birds have 2-3 broods a season. They prefer clean houses for each brood. It's Hummingbird Season and fresh nectar is essential! Feeders should be emptied and rinsed (no soap!) two to three times a week—or sooner if it looks cloudy—and refilled with fresh nectar. Clean feeders regularly! Check for mold and clumpy seed, particularly after lots of rain and humidity. Hot soapy water is great for seed feeders. Soak. Scrub. Rinse well. Dry. Refill. Keep shell debris at a minimum under your feeders, even if it doesn't bother you! Accumulated shells carry mold that can be deadly to ground feeding birds. Don't prune during nesting season as most birds nest in dense shrubbery, bushes and trees. Please be aware and delay until Fall when possible. Reconsider using pesticides, especially widespread spraying for mosquitoes. Birds feed their babies almost entire on insects while they're in the nest. Pesticides kill all the beneficial insects and caterpillars too! A healthy insect population is critical to a healthy backyard habitat. See The Backyard Naturalist’s natural mosquito repellents. Sit back and enjoy all the adorably awkward juvenile birds learning how to use your bird feeders and baths!